CAMP PENDLETON, Calif. – The Marine Corps is planning for a future that will pit Marines against an enemy well-versed in fighting and hiding in crowded urban areas and equipped with high-tech weapons and communications systems. Current events have validated these assumptions about future operations, including the use of bomb-bearing and swarm-capable drones during recent attacks on a Russia base in Syria. Such threats loomed large as a Marine infantry rifle company took to the streets of a Camp Pendleton combat town this week to experiment with several dozen new technologies and prototypes designed to make them more lethal, effective, efficient and agile in an urban fight. 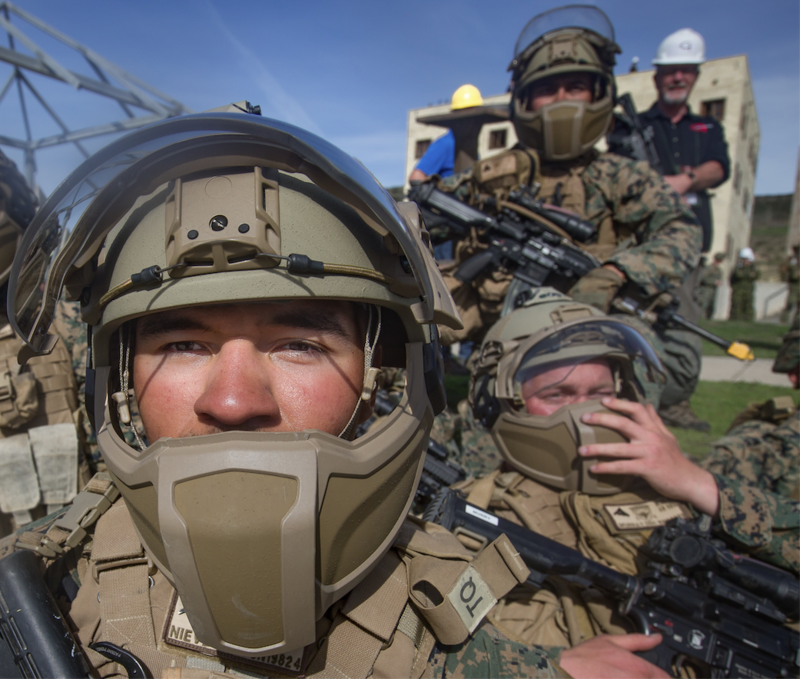 About 180 Marines are participating in the Urban 5th Generation Marine Exploration and Experimentation 2018 exercise at Camp Pendleton. U5G 2018 runs from March 15-25 and is the first in a progressive series of exercises this year focused on identifying potential technology enhancements for the Marine Corps rifle company and its subordinate units. If he had his way, Capt. Ben Brewster and his rifle company would get to fight and operate under a “protective bubble.” Brewster describes it as created by layered offensive and defensive unmanned aerial systems (UAS) – both organic to the company and from the larger Marine air-ground task force – that would include systems and equipment to kill or neutralize enemy or threatening drones in the air. Potential adversaries and terrorists already have access to new widely available technologies including inexpensive, commercial off-the-shelf systems like drones – and that adds more complex threats to military forces and civilians in the urban environment. 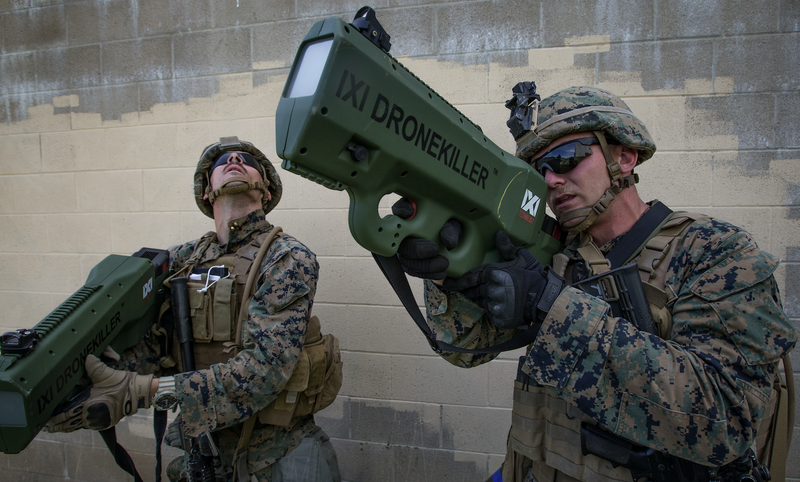 “I’ve never had to deal with IEDs that can attack me…from quadcopters,” said Brewster, commander of Kilo Company, 3rd Battalion, 4th Marines. Three drones flitted overhead at the Range 131 Military Operations on Urbanized Terrain (MOUT) facility here, and an “enemy” drone – a bat-wing-shaped UAS – sliced through the air as Third Platoon moved among buildings around a town square. “Anyone of these could have a two-pound IED (improvised explosive device)” or act as a spotter or command-and-control for an enemy force, he said. “I need the ability for my Marines to be able to jam these drones,” he added. Brewster envisions a “protected bubble” that would shield the Marines and platoon corpsmen from those potential threats, with “our own drones in front of them” offering additional protection and defense. A combination of manned and unmanned aircraft, operated by the higher Marine air-ground task force command, he said, would provide the company with the added protection of a “Guardian Angels” capability and more persistent UAS coverage. And with the expected crowded urban skies, he noted, Marines will need systems to help sort friend from foe in the air, along with counter-UAS technology with directional jamming capabilities. “Trying to figure out that part is what we’re experimenting” during U5G, he added. Several naval warfare centers and military laboratories joined 48 companies for U5G, showcasing 79 technologies that included sensors that see through walls, facial recognition software, “smart” networked radio, micro drones and an enhanced thermal imager with displayed information, as well as vehicles, weapons and munitions. The Marine Corps Warfighting Laboratory and the Deputy Assistant Secretary of the Navy for Research, Development, Test and Evaluation are hosting U5G, the latest in a series of Advanced Naval Technology Exercises (ANTX) where military research and development organizations join with industry to demonstrate rapidly-emerging technologies and concepts. It follows on last year’s Ship-to-Shore Maneuver Exploration and Experimentation Advanced Naval Technology Exercise at Camp Pendleton that solicited and examined dozens of concepts like drones, mobile networks and unmanned boats to support Marines operating at sea and landing ashore. 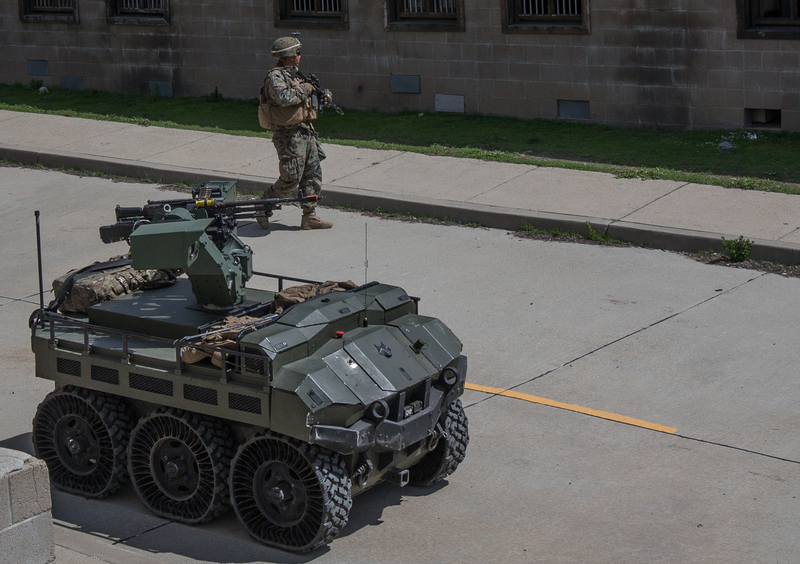 This year, the Marine Corps solicited ideas that included quadcopters, counter-unmanned air systems, unmanned ground vehicles, command and control, communications and electronic warfare, all to support the rifle company. Technology and gear displayed in a large tent at Range 131 included prototypes or fledgling concepts to counter UAS threats as well as beef-up UAS capabilities and payloads and geared to small units. Among them is the SkyWall 100. The drone-capturing system was developed three years ago by OpenWorks Engineering, a Northumberland, U.K., company, for commercial use as well as counter-terrorism, marketing director James Cross said at the event. The portable, 25-pound system is shoulder-launched – or it can be mounted on a vehicle – and fires a mortar-like projectile containing a net up to 120 meters at a flying drone. “It’s real easy to operate,” Jason Magee, a technical specialist, said. An embedded parachute deploys to cushion the landing for possible retrieval, which he noted could aid in things such as intelligence collecting and exploitation. Another company, CyPhy Works, Inc., of Danvers, Mass., brought PARC – Persistent Area Reconnaissance and Communication platform. The tethered drone can fly up to 400 feet to give a unit a persistent situational awareness, expanding its intelligence, surveillance and reconnaissance capability with payloads such as cameras. The drone can be launched from the ground or a vehicle, and its tether lets it operate for much longer duration than free-flying drones. “The drone is autonomous; it flies itself,” John Amick, CyPhy’s director of defense systems, said at the event. For the experimentation, Kilo 3/4 received new gear earlier this week that included lightweight helmets with removable visors and chin protectors, officials said. They spent two days in a limited technical assessment (LTA) that provided an initial demonstration of the equipment. 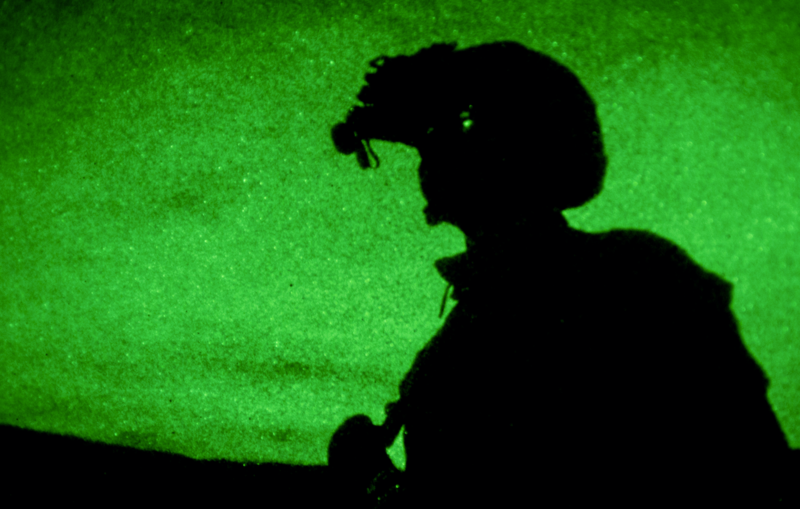 That was followed by two days of a limited objective experiment (LOE), where Kilo Company’s platoons conducted urban operations with selected technologies in two “vignettes”: securing key infrastructure – in this case, reinforcement of a U.S. embassy – in a hostile environment, and clearing and securing an urban village in support of a broader military operation. So far, “some successes, some failures,” Brewster told journalists Thursday during a media day event. Brewster is a huge fan of technologies including KILSWITCH that turn his smartphone into a command and control hub that pulls networked data, imagery and other information for clearer situational awareness for his platoons and squads. Battlefield tracking software in the common operating picture that easily identifies everyone in his unit, down to the fire team level, is something “we never had before,” he said. And other technologies demonstrated or displayed during the ANTX exercise can help identify threats, denote potential targets to surveil, coordinate fires, even create detailed 3-D imagery of an urban area, down to the sewers, that would help Marines’ operations in a city as well as assist with targeting. That would be a huge leap from the less-detailed and questionably accurate paper maps he had used several years ago during a combat tour in Afghanistan, Brewster said. Sgt. Ryan Reeder, MCWL’s small unit tactical adviser, said the Marines seemed to like the Beartooth, a small, lightweight radio developed by Bozeman, Mont., Beartooth Radio, Inc., that uses a smartphone and enables a platoon to talk, text and “see” each other without the need for cellular service or Wi-Fi, according to an information sheet. Gidget Fuentes is a freelance writer based in San Diego, Calif. She has spent more than 20 years reporting extensively on the Marine Corps and the Navy, including West Coast commands and Pacific regional issues, and most recently was a senior writer and the San Diego bureau chief for Marine Corps Times and Navy Times.